1 day trip from Marrakech to Orika valley. We will leave Marrakech around 9:00 a.m. We drive toward the Atlas Mountains enjoying the beautiful landscapes, views and Berber authentic (16th and 17th century) villages and towns. Our First stop is in a traditional Moroccan house, to see how people live and how they cook. From the roof of the house you can see a beautiful view on the 17th century village and on the valley. The lady (owner of the house) will make a tea ceremony to show us how to make mint tea and then they will serve us a kind of country breakfast (bread, butter of goats, honey, real olive oil and tea). After this we continue deeper in the valley, we stop for a 15 minutes camel ride (not included in the price). After the camel ride we drive until the end of the road, we leave our vehicle and go trekking for around 2 hours to see waterfalls (cascades). Then we come back to the 4×4 car and drive half a way when we stop for lunch in a nice restaurant having beautiful view on the valley. Lunch is composed of a variety of Moroccan specialities. After lunch we drive back to Marrakech. 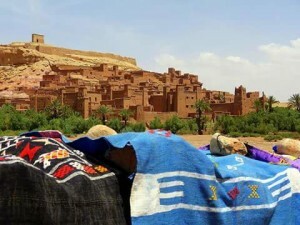 1 day trip from Marrakech to Ait ben haddou kasbah. This day tour from Marrakech is perfect for those of you who want a glimpse of the desert and the beautiful kasbahs built by the Berbers. 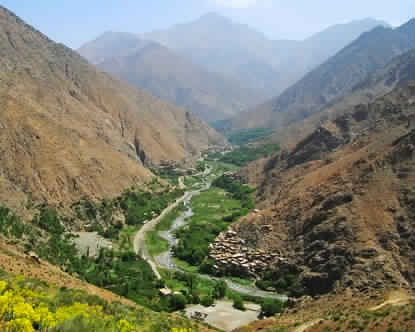 Three hours drive takes you to the gateway of Sahara, traversing the Tichka pass in the High Atlas. The steep mountain hillsides are clustered with fortified villages (Kasbahs). You’ll spend the afternoon exploring the UNESCO world heritage site of Aït Benhaddou kasnah ”castle”, used as a backdrop for shooting more than 21 films and was one of the most important fortress strongholds on the old salt caravan route where traders brought slaves, gold, silver and salt from Saharian Africa to Marrakech area and beyond. After lunch in the Kasbah you will visit the old Pacha Glaoui Kasbah in Ouarzazate. This kasbah has an amazing story behind, intrinsically linked to the formation of Morocco as a country in the 20th century. . This trip is recommended for all year round.The trip starts at 7:00 a.m. from Marrakech and ends at 19:00 back to Marrakech city. 1 day trip from Marrakech to Ozoud waterfalls. 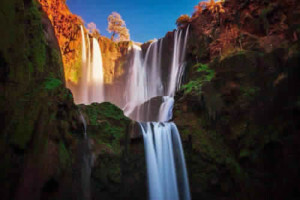 After morning pickup from your hotel or riad in Marrakech, travel by 4×4 vehicle or minibus 93 miles (150 km) northeast to the village of Tanaghmeilt in the Atlas Mountains, the home of Ouzoud Falls. As you drive past lush green valleys, old water mills and acres of fruit trees, your knowledgeable guide will share facts and anecdotes about this scenic region. At 360 feet (110 meters) high, Ouzoud Falls are the highest falls in North Africa. Ouzoud means ‘olive’ in the Berber language of Morocco, so it’s no surprise the plateau above the falls is draped with thousands of olive trees. The ground below is brick-red because of iron oxides in the soil. Follow a short path to see the magnificent tableau of six different waterfalls cascading down the cliffside. It is a refreshing and rejuvenating sight here in a land often stricken by drought. Keep your camera handy for one photo opportunity after another. In the morning, if you’re lucky, you may glimpse a macaque monkey nearby. In the afternoon sun, you may see a gorgeous rainbow over the falls!If you’d like to get a different perspective on Ouzoud Falls, you can walk down stone steps to the bottom of the falls. Better yet, hire a guide who can show you some caves along the way. Savor a traditional tagine (own expense) at a restaurant in the shade of the olive trees before heading back to Marrakech. Your relaxing day trip to Ouzoud Falls concludes with drop-off at your hotel or riad at about 5pm. 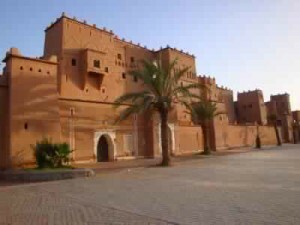 1 Day Trip from Marrakech to Essaouria – Atlantic Coast & Ancient Fortress. 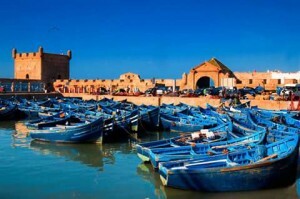 From Marrakech it is a leisurely drive to the Atlantic Coast and the former Portuguese stronghold of Essaouira. Despite seeing an increase in visitors over the years, this town remains one of Morocco’s best-kept secrets. Complete with a bustling historical centre and surrounded by ancient city walls, Essaouira is a delightful destination for a day trip. Explore the atmospheric alleyways of the ancient medina, and the old ochre ramparts which now provide protection from the wind-assisted waves of the Atlantic Ocean. 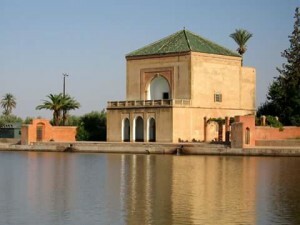 1 day tour in Marrakech city. Discover the city of Marrakech in this enlightening full day tour. Immerse yourself into the history, art and culture of this magnificent walled pink city. Photograph the magnificent Koutoubia mosque with its great square tower and shining copper globes. Stroll along the bustling alleyways and see the mosques, traditional bakeries, old lodging houses and fountains carved of wood. Visit the Medrassa ben Yousef as one of the largest theological college in north Africa. Walk through the alleys of the Medina and visit the most interesting handicrafts quarters , see an enchanting display of arts and crafts in the colorful souks before you relive the atmosphere of a glorious age in the exquisite rooms. 1 day Trip from Marrakech to Ouarzazate. This journey take us through breathtaking countryside via Tizi N’Tichka pass ,the highest pass in North Africa. We will discover a remarkable area which is characterized by the magnificence and also by beauty of its various landscape.We will stop for a visit of the famous, fortified city of Ait Ben Haddou. Classified as aUNESCO World Heritage Site, it has been the backdrop for many films as Gladiator, Prince of Persia and many others.We will enjoy a city tour of Ouarzazate, whose name is the Berber word for “no noise.” We will also visit the Taourirt and Tiffoultoute Kasbahs which were the ancient residences of Glaoui (old Pacha of Marrakech). Afterwards, we enjoy our lunch at local restaurant before we return to Marrakech.